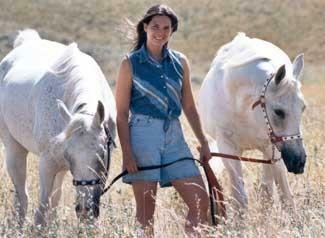 I’m a life-long horse lover who grew up in Idaho. Like many little girls, I begged my parents for a horse. Unlike many little girls, my prayers were answered when my parents bought my 1980 grey Arabian mare. In retrospect, our partnership had all the potential for trouble – we were the dreaded “novice horse/novice rider” combination – but our relationship lasted 30 years (I lost her in late 2017). Together we raised and trained her colt, who was born in 1990 and was supposed to be a 6-month 4-H project (but he still lives with me!). My Arabian horses waited for me when I left for college and even when I chased a career all the way to Washington, D.C. Then I found my way back to the good life in Wenatchee, Washington State, and married my husband. Together, we added yet another horse to the stable (a pinto/walker cross). We also added four children to the mix - and I'm blessed that my kids enjoy riding with me. As I get older, I have a new appreciation for all the values that horses are here to help teach us: patience, firmness, leadership, courage, humility, and understanding. Much of my childhood was spent drawing horses, but I began sculpting in bronze in 2006. I've always admired Western sculpture, where horses and riders capture history and bring it into the ever-present moment. Most Western sculpture tells a story that helps viewers identify with our American past. As a female artist and horse owner, I believe that Western art should add an important modern link - the love affair that women and girls have for their horses. Many of my sculptures illustrate this emotional relationship. Any girl who has yearned for a horse or been fortunate enough to have one in her life will identify with these pieces. In addition to creating sculptures that evoke emotion, I strive to capture action that inspires appreciation for the movement of horses. I also enjoy Christian-themed sculpture that incorporates animals. More recently, I have branched into Western wildlife art. While I hope the viewer finds his or her own way to relate to a piece, I share the stories that inspired each piece in an accompanying certificate of authenticity. Some of these are personal experiences of individuals whose encounter with horses, ranches and wilderness changed their lives forever. Each piece is one of a limited edition and will be sold with a certificate of authenticity. Commissioned works may also be available upon contract. Contact artist@suzannegrassell.com or call (509) 264-1010. © Copyright 2006 Suzanne Grassell. All Rights Reserved. No images appearing on this web site may be used or reproduced in any form without the copyright holder's written permission. By entering this site you agree to the above terms.